Leafwings are butterflies; they are part of a subfamily of butterflies that includes about 400 species. There are many variations of Leafwings; some are very colorful like bright orange. The bottom part of their wings is grey or brown. These colors help them to resemble a dead leaf when they are resting and close their wings. Leafwings are considered rare creatures. 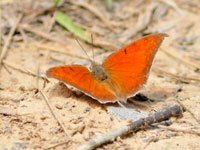 What does a Leafwing look like? The underside of the Leafing looks like a dead leaf, great camouflage against predators. 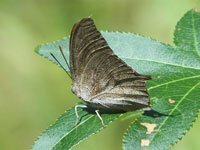 In the summer the males have a little hooked forewing tip and a short tails on the back of their wings. The males are more colorful then the females. The colors of the under wing vary per species, from grey to brown. The female Leafwings have slightly more rounded wings then the males. 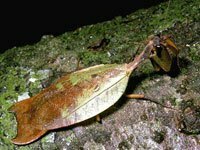 Adult Leafwings fly low to the ground but they can sometimes be seen flying higher amongst the trees where they hang on a twig and use their camouflaged wings to mimic a dead leaf. Where does the Leafwing live? What does a Leafwing eat? Adult Leafwings are very strong and fast flyers and have a great endurance. Leafwings can be found feeding from decaying fruits and tree sap; they do not feed on nectar from flowers like butterflies usually do. 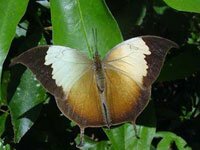 Did you know about these Leafwing facts? 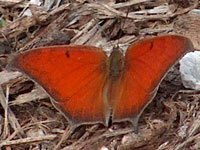 When a Leafwing is disturbed they will fly into the forest and fold up their wings so they blend in as a leaf. The butterfly's lifespan is short; it varies from a few days to about 8 months. 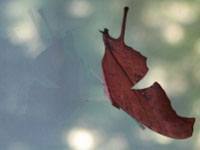 Download free Leafwing wallpapers, click on the image to open the large version. Print free Leafwing coloring pages, click on the image to open the large version.